When comparing old products to new products in the concrete stain and dye industry, there is acid stain and there is everything else. Until the late 1990s and early 2000s, reactive acid stains had been the staple for close to 100 years. 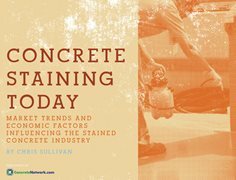 As the concrete stain industry grew rapidly in the early 2000s, new products started appearing, and the pace and variety of new stains entering the market has only increased over the last years. These new products are primarily water-based and come in a wide range of colors. Most are also UV stable, so they can be used for both exterior and interior applications. The liquid portion of these new stains and dyes is primarily water or water-based resins, which fits what’s considered acceptable by U.S. Green Building Council’s Leadership in Energy and Environmental Design (LEED) building program. The active or color portion of most new stains is mostly paint-grade resins that are finely dispersed to allow for better penetration into concrete. The big difference in most new nonacid stain systems is less in performance and look, but in how the products are marketed and promoted. Most of the new products are touted as acid stain replacements that can save time and labor while achieving the same look and appearance as an acid stain. Depending on who you talk to, the level of excitement about new products in the stained concrete industry varies greatly. Some contractors are truly excited about the ongoing surge of new water-based nonreactive stains and dyes into the market, while others tend to stick with the tried-and-true acid stains that have been working for them for years. Even though there is a disparity in the level of excitement over new products, it does not directly relate to product use. Nearly all contractors have used the new-generation stains and dyes. Just how much a contractor will use them comes down to individual preference and the specific project. Tim Fisher, owner of Fisher’s Concrete Company, Louisville, Colo., is not that excited about the new stains on the market, but this does not preclude him from using them. He prefers the look and feel of acid stains, which he has been successfully using since he started his business in 2004. But when the job calls for a color or look that acid stain can’t produce, he will use a newer water-based acrylic stain to achieve the desired result. “I use newer stain and dye technology when needed, but always default back to acid stains for the base color,” he says. The new generation of stains has a much larger color palette, which is advantageous when customers are looking for colors not offered by traditional earth-tone reactive stains. On the opposite side of the excitement spectrum is Shelly Rigsby, owner of Acanthus/Concrete Stain Designs, Dallas. Rigsby is an artisan who built her 13-year-old company around acid stains. She loves the look of acid stains, but told me that she is excited about the new stain technology on the market. “I am excited about the diversity of products on the market - stains, dyes, and water-based tints,” she says, and has used all of them in her work. She follows color trends, and loves the expanded color palette the new stains and dyes offer. Rigsby says that before she uses any new technology or product, she does her homework. “You can create the most artistic floor using new stains and dyes, but if it does not perform, it is a failure,” she says. Rigsby tests the products and makes sure they are compatible with all of the other products she uses on her projects, and she always reads the technical data sheets, which is the best place to start when working with any new product. Greg Hyde, owner of Hyde Concrete in Annapolis, M.D., is someone who falls in the middle. “I’m inherently inquisitive and interested in new products,” he says, but he does not get overly excited about them. He has his proven system, but likes keeping on top of new technology. Hyde has an engineering background, so he looks at new products and systems from a technical point of view. He is less excited about how the new stain products look and more interested in product consistency and customer service from the manufacturer. “It comes down to service, and that the product performs consistently from job to job,” he says. Hyde is among a large segment of contractors that have little interest in the hype surrounding new products in the market, and want and expect more in regard to performance and technical service before and during the job. The professional applicator who is serious about staining concrete will look at new products as they appear on the market, but will end up using those that meet their expectations in regard to performance and service.